On this page you will find demo videos of the machines and equipment distributed by Rinaldin. We are planning to publish gradually other videos, so as to show all the equipment included in our catalogue. We therefore suggest then that you come back frequently to visit this page. You will always find some new videos. The mitre saw OMGA 1P300 is particularly suitable for cutting mouldings at 45° and other angles. It replaces the previous model T300. The GP350 mitre saw is used for the cut at 45°, at 90° and other intermediate angles. It works with 350 mm diametre blades. Can cut up to 11 cm large mouldings. It is very robust and has innovative technical solutions. The double bladed saw OMGA V235 cuts mouldings at a fixed 45° angle. It's provided with a diagrammed table with a supporting edge and a mobile pneumatic stop. Two blade pressors adjust automatically to the outline of the moulding. This double blade mitre saw Alfamacchine T400 is needed to cut mouldings at a fixed degree of 45°. It’s provided with a diagrammed plane with a supporting surface and a pneumatic mobile stop. Two pressure plates adapt automatically to the shape of the moulding. The pedal guillotine Morso is needed to cut the pieces of the frame at 45°. The advantages of the guillotine: it doesn't make noise, it doesn't produce dust, it doesn't use electric energy, in a single process it executes the right and left cut. The video describes the blades with their characteristics provided by Rinaldin for the guillotine. Changing the blades of the guillotine. Interesting also for expert framers to look at, so see if we show alternative methods. A few tips and advices to help you use the guillotine at its best. It might also interest expert framers. 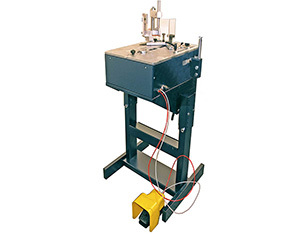 The manual bench guillotine is used to cut at 45° small wooden or plastic slips. 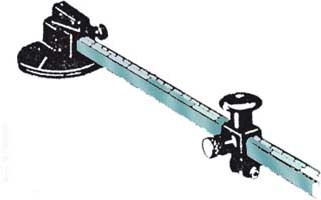 It's made up of a 100 cm diagrammed table, 2 blades, a lever which makes the blades fall, a measuring stop. The manual M4 underpinner is used to mount frames. It works with pedal, without compressor. It uses universal wedges and allows the superimposing of wedges. It's suitable for beginners, for photographers and artists who want to make their own frames. The pneumatic underpinner Joint 5x5 Super is needed to join the pieces of a frame. 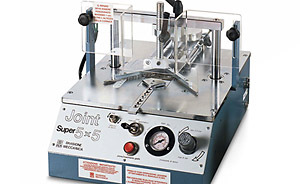 The underpinner Joint 5x5A is a model which is less automatic than the 5x5 Super. The A2M underpinner, manufactured in Italy by Alfamacchine, is needed to assemble frames. It does not require a compressor. Suitable for novices, photographers and artists. Very easy to use. Maximum moulding width 13 cm. The pneumatic underpinner U300 is needed to professionally assemble the pieces of the frame. The pneumatic underpinner U300P is particularly apt for the framer who produces frames in a series. The time to set the machine for the first frame is much longer than for other underpinners. The performance time however is much faster. The pneumatic underpinner U400S, manufactured in Italy by Alfamacchine, is needed to assemble the pieces of a frame. It is provided with an inclination adjustable base. The pneumatic underpinner U400 is needed to join the pieces of the frame. Suitable for framers with a good volume work. The main characteristics of the U400 are the series of metallic chargers and the possibility of joining very wide frames. The pneumatic underpinner Freccia 2000 is needed to assemble frames in a professional manner. It is for cleaning glass in a very rational way. It is made up of fillets in PVC fixed to each other at the joints so as to be extendable and then closed again easily. Rubber bumpons hold the glass still, so it is unnecessary to hold the glass with your hands. 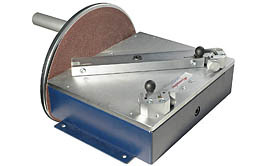 The “Fletcher Oval-Circle” cutter is needed to cut oval and circular glass. Maximum diameter 53 cm, minimum 11 cm. The Glass cutter CircleMate by Fletcher has two functions: cutting glass into circles and cutting glass sheets longitudinally. 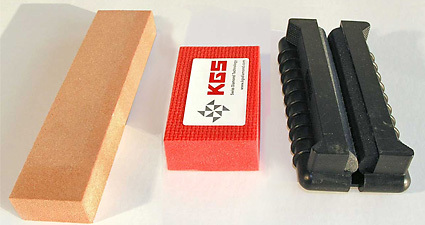 Tools for grinding glass: carborundum file, diamond pad and cylindrical grinders. 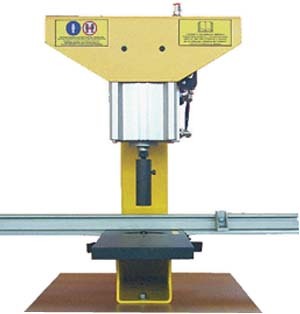 The push-style Logan 2000 mat cutter is used to cut bevel matboards. Cut is done by pulling the cutter. Guide marks help you to minimaze overcutting at the corners. 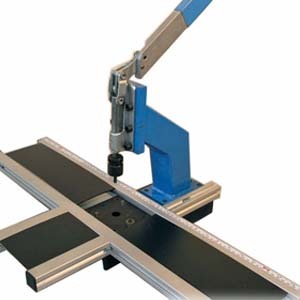 The pull-style Logan 4000 mat cutter is used to cut bevel matboards. Cut is done by pulling the cutter. Measuring bar with pencil led. 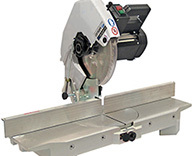 The Logan 5000 is used to cut normal and thick matboards. It works with L270 or L271 blades. Matchable with Logan L301 - L450 - L750 - L760 cutters and with the L540 and L560 rulers. 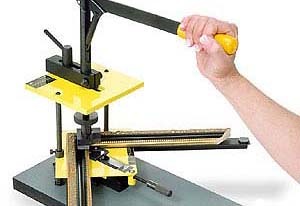 The Logan 450 Mat Cutter is used to cut matboards. Downsize matboard up to 29 1/2" (102 cm). Includes parallel mat guide, mat guide, L4000 bevel cutter and L7011 straight cutting head. It works with L270 Logan blades. Suitable for artists, hobbiests and framers with a small volume work. The Logan 750 and 760 Cutters are used to cut maboards. They are composed of the solid base with laminated surface, the square, the parallel guide, double cutting stop, the head for 45° cuts and the head for 90° cuts. The maximum cutting length of the L750 cutter is 101 cm. The maximum cutting length of the L760 cutter is 152 cm. Suitable for artists and photographers. 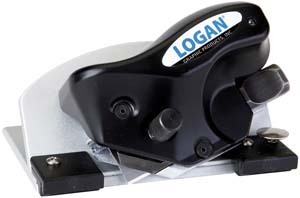 The Logan 850 - 855 - 860 Cutters of the "Logan Platinum Plus" Series are professional cutters for maboards. Available in three sizes: L850 102 cm cut - L855 122 cm cut - L860 152 cm cut. 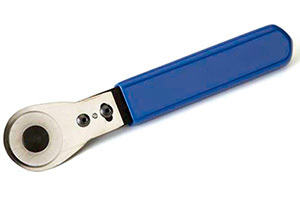 The Logan Platinum Plus cutters work with L267C blades. The Cutter 7011 by Logan is used for 90° cut of mat and foamboard. It is used to mark the guide lines for cutting the matboards and to mark guides for the decorations. How to decorate mountboards with metal decorative tapes. Very useful the mountboard square to draw the guide lines. How to increase the mountboard's depth by using foamboard covered with decorative self adhesive tape. 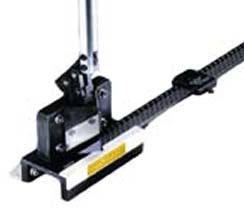 The Logan 201 Mat Cutter, manufactured by Logan, is used to cut oval and round matboards. Cuts bevel openings: ovals from 7x11 cm to 51x58 cm. Maximum difference between oval width and oval height is 8 cm. 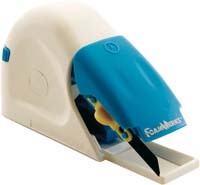 The "Oval-Circle" cutter manufactured in the USA by Fletcher is used for cutting mountboard either in circles or ovals. The German board cutter Ideal 1110 can cut board, carton, paper, textiles etc. The maximum thickness of the material is of approximately 4 mm. The cutting light is 111 cm. It has a small pedal presser, a supporting surface, a diagramed scale, an overturning surface that can be added, a device to cut thin strips. This Bench-end Guillotine has to be fixed to a table border with some screws. It has an auto sharpening blade. It can cut paper, card, gray carton, passepartout carton, etc. It has the squaring bar and e small presser which holds the sheet that needs to be cut in place. The Total Trimmer is a cutter that can cut any material: foam board, cardboard, corrugated cardboard, mat. The maximum thickness of the sheet to be cut is 13 mm. Available in two versions: cutting length of 102 cm and cutting length of 152 cm. Works with L267C blades. Rotary Knife T50, produced by Logan. Used to cut paper and fabrics. 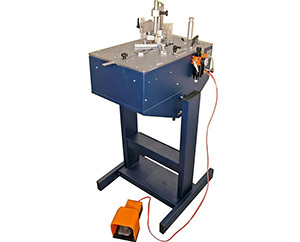 The vertical cutter Gladium is used to vertically cut various materials such as cardboard, mountboard, glass, plastic glass, polystyrene foam etc. The vertical cutter SteelTrak produced by Keencut can cut different material such as cardboard, hardboard, masonite, MDF, aluminum, polystyrene, PVC, glass. The vertical cutter F3100 can cut almost all materials: glass, cardboard, MDF, foam board, plastic materials and so on. 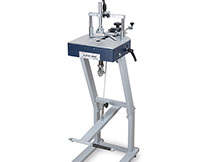 The Champ3 fixing machine, manufactured in the USA by Craft, is used to fix hangers to the back of the frame and to fix hinges between the photoback and the strut. 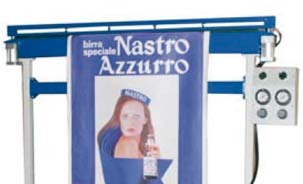 The pneumatic fixing machine PG550 produced in Italy by Pozzi-Ghislanzoni, is used to apply determined hangers to the strut of the frame and to link the back of a picture frame with its strut. - Apply the hanger to the support of the frame. - Apply the hinge fixing the support to the back of the photo frame. 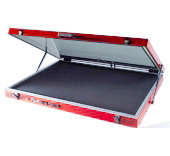 The Hot Glass Vacuum Press is needed to dry mount a poster to a carton in a rational way. It is possible also to apply a protective or decorative film. The manual Zenith laminator is needed to mount and laminate. It's essentially made up of 2 rolls through which the material to be mounted or laminated is passed through. Laminating can be made with different kind of films to obtain an opaque, glossy or satin effect. 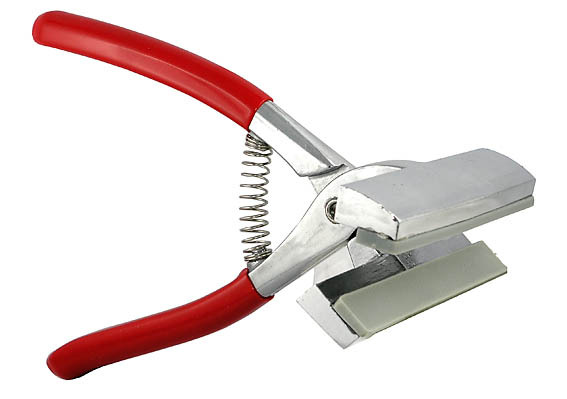 The stretcher pliers for canvas is an instrument which helps to stretch the canvas and fix it to the stretchers. The video shows how the stretcher pliers. The pneumatic canvas stretcher "Tendy" is used to fix the canvas to the frame. It needs a compressor and a pneumatic fixing gun. 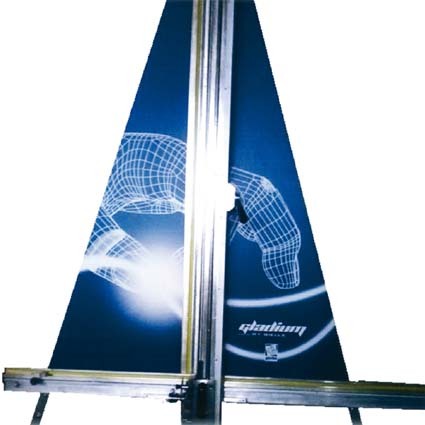 Impak's wrapping system is needed to wrap and protect frames and other objects with a transparent PVC film. The system consists of a series of panels fixed together to form one long panel on the wall. Every panel has vertical rows of holes into which plastic hangers are inserted which support the samples. One of the advantages is the possibility to reconstruct the display very quickly or replace models that are running out. It is made up of a panel with 20 little horizontal strips into which the samples are inserted. The panel can be hung on the wall or stand on the shop counter. 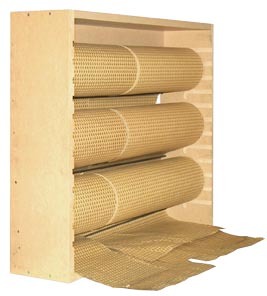 It is used for distributing the paper in a very rational way, for closing the frame at the back or as wrapping paper. A very clever system has been invented whereby the paper is unwound at table level. Hanging systems without the need of making holes in the walls. Suitable for for galleries and expositons where the frames have to be frequently replaced. Click Rail, Click Rail Pro, Top Rail are used. It is a system for hanging frames without making holes in the wall. 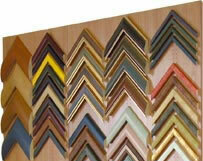 Suitable for galleries and exhibitions where the frames have to be changed frequently. You use Classic Rails and Classic Rail Plus. 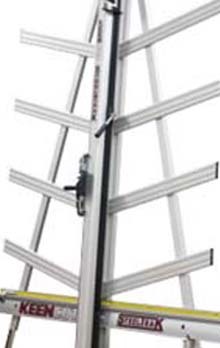 Contour Rail is an innovative system for hanging frames. Composed of a rail, vertical very thin wires and the brand new Micro Grip. The system Deco Rail is made up of an aluminum rail on which a decorative frame is placed. On the rail you apply wires which support hooks and frames. The Display-it system is an elegant way ofIt is composed of the plexiglass holders, the steel vertical wires and finzing clips exhibiting photographs. The Up Rail Hanging System is composed of a rail applied to the ceiling with proper accessories. You will hang wires to the rail, bearing hooks and pictures. Kiasu is an elegant easel system for photo frames. The video describes how it works and suggests the best solutions. 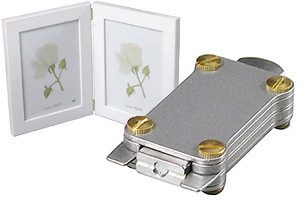 Curl Up is an elegant easel system for photo frames. 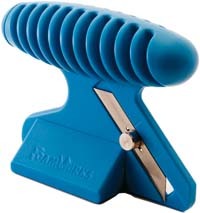 Mighty Mouse is a tool which is used to attach the brackets used in the ‘Curl Up’ system, to the backing board. The video describes how it works. 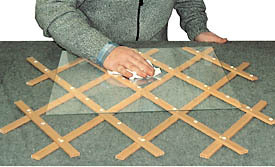 The video shows how to use the backing boards with the "Kiasu" and "Curl Up" Easel System. 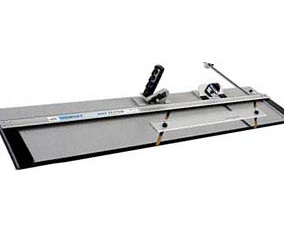 The WC6001 Cutter, manufactured by Logan, is used to make straight 90° cuts on foamboard, till a maximum depth of 12 mm. The WC6010 Cutter, manufactured by Logan, is used to make straight 90° or bevelled 45° cuts on foamboard. 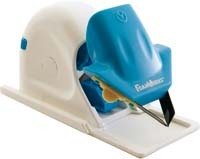 The Cutter Free Style by Logan is used to make free hand cuts on foamboard sheets. 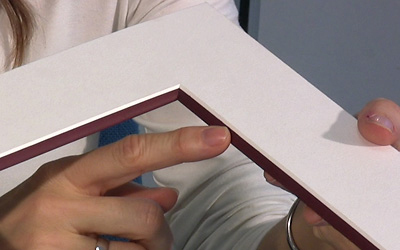 The Foam V-Groove Cutter makes V-grooves on tender supports such as foamboard. The Hole Drill by Logan is used to obtain round holes of 3 sizes in the foamboard. 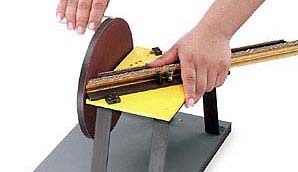 The Circle Cutter by Logan is used to obtain the cut of round cuts in the foamboard. Used to obtain a special cutting on the border of foamboard to facilitate the corner jonction of two boards. Suitable also for left-handed. It works by pushing or pulling it. Used to rapidly find the centre of the side of the frame where the hanger will be applied. 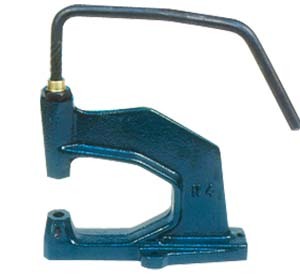 The hand operated rivet machine is needed to fix certain hangers to a carton or of other similar materials, support. Particularly useful to fix the hanger to the back of clip frames. 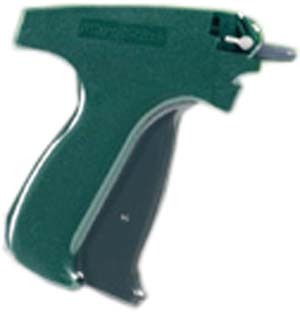 The MicroStitch gun allows you to quickly and accurately mount fabrics or canvas to the frame support. The special gun fires nylon strips penetreting the cardboard (or other support) and fixing the fabric. This tool is used to fix a hinge to join two frames. The insertion of the hinge is made with a hammer. 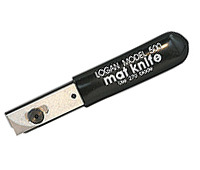 The mat knife Logan 500 is used to cut at 90° hardboard, matboards, foamboard etc. The depth of blade is ajustable. Uses blades L270. The manual precision sander Logan F200-2 is used to obtain a smooth finish of the 45° cut of the 4 pieces of the frame before assembling them. The maximum moulding width to sand is 60 mm. Diameter of the disc 21 cm. Weight 5 Kg. The MTS polisher, produced in Italy by Alfamacchine, is needed to polish the moulding's cut at 45° before assembling the frame. It is a very strong and reliable machine, suitable both for the hobbyst and the framer. The PFK04 Frame Joining Kit, manufactured by Framers Corner, is used to join the 4 corners of the frame. Drives all single v-nail, that can be superimposed. Suitable for beginners and hobbysts. The underpinner Studio Joiner, manufactured by Logan, is used to join the 4 corners of the frame. The moulding is fixed upside down. Maximum width of the moulding: 6 cm. Clamp to hold blocked the two pieces of mouldig cut at 45° by using the wedges. Suitable for hobbiests. 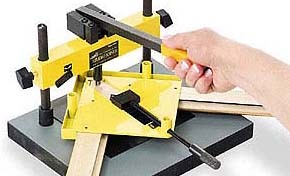 The clamp is a part of the joiner Studio Joiner and Pro Joiner but can also be used separately from the joiner. The underpinner Pro Joiner, manufactured by Logan, is used to join the 4 corners of the frame. The moulding is fixed upside down. Maximum width of the moulding: 6 cm. 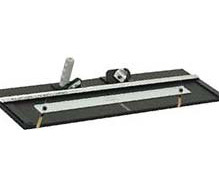 The Logan 301 Mat Cutter 301 is used to cut matboards. Downsize matboard up to 73 cm. It is composed of cutting board, cutting guide, cutting head L2000 and cutter L500 for cut at 90°. Suitable for artists and hobbiests. 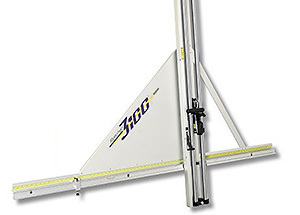 The Logan 350 Mat Cutter is used to cut matboards. Composed of a cutting base, a parallel mat guide, a head for 45° cuts and a head for 90° cuts. Suitable for photographers, artists, hobbiests and framers with a small volume work. Introductory video to the gilding course, which gives basic knowledge on water gilding and size gilding. We advise you to study the full gilding course composed of 11 videos. The course is for framers who want to delve into the topic of gilding. It is also for those who want to practice gilding as a hobby. The videos also provide instructions on how to use all gilding products provided by the Rinaldin. The first phase of gilding is applying the gesso. Gesso and rabbit skin glue must be mixed together and then applied. At the end you must sand the surface. Bole is needed to prepare the surface for the application of the gold and silver leaf. You must apply several layers on the gesso. When it has dried, it must be sanded and polished. The acrylic bole is an alternative product which substitutes the gesso and rabbit skin glue mixture. It is used for water gilding. It is available both white and coloured. The video shows in detail the sequence of the application of the gold leaf and real silver. It shows also the burnishing of the leaf. The size is a liquid which after a while that it's been applied it becomes sticky so that the imitation leaf can be applied. It must be applied on the gesso after the shellac. The video shows various kinds of size. The video shows different kinds of imitation leaves: gold, silver, copper. The transfer gold is gold that's been pressed against a thin tissue paper. The video shows how to apply it to the frame. 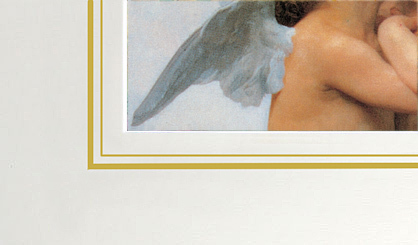 The roll gold leaf is particularly suitable for gilding fillets on mouldings. The video shows how. The video shows how to age a frame by a bitumen wax or the bitumen of Judea. It also shows how to make a golden frame from a silver frame. Decorative engravings are funny and easy to make. 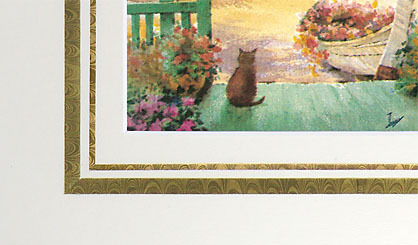 The video shows how to gild a frame and make a decorative engraving. The video shows how to make gilding on decorative ornaments made of a proper paste. The video explain what is the conservation framing, its principles and its main features. The pH scale is important in conservation framing. The video explains the pH scale and the relation between pH and mountboards. This video explains how to mount the artwork on the undermount using the T-hinges. How to prepare yourself the corner pockets that serve to support the framework without tapes. In conservative framing the sef-adhesive tapes are not accepted. Pressure adhesive tapes are not allowed in conservation framing. This video explains the use of corner pockets to mount the artwork on the undermount. The video proposes two ways to mount the artwork on the undermount without self-adhesive tapes that are forbidden in the conservation framing. This video explains what to do if you want to mount the artwork on the undermount without hiding the edges. When the artwork is very thick there are some problems with the mountboard. This video explains what to do in this case. This video explains how to seal the sandwich formed by the glass, the mountboard, the artwork and the undermount. The damages caused by the light are the most important problem in conservation framing. The video shows which are the advisable types of glass. The wood of the rebate should not touch the artwork. The solution can be a spacer. If there is no spacer the rebate should be sealed with an aluminium tape. The video shows what concerns the back of the frame: backing board, protection paper and bumpers. This video explains the characteristics of the materials provided by Rinaldin used for conservation framing.